Many of you know that I did the Whole30 challenge. It was pretty awesome and today I'm sharing what happened. Will I tell you how much weight I lost?... no. I didn't do it to lose weight and you shouldn't either. It's about changing your life and getting healthier by starting with food. Losing weight is an added benefit of eating whole foods! I woke up a lot easier in the morning. I felt rested and ready for my morning workout or to get ready for the day. I was always SO hungry when I woke up (the book says that when your hormones are regulated, you SHOULD feel hungry when you wake up). Being hungry when I woke up really got me out of bed a lot faster. I used to never be hungry for breakfast and I used to drink a protein shake instead of eating. Yuck. On Whole30, I ate breakfast at the kitchen table every morning and loved having that food as my fuel for my morning of teaching 1st graders. During the day I had a serious truck-load of energy. This is by far one of the BEST things about Whole30. I honestly couldn’t believe it. Sometimes I felt a euphoria-like high. That’s how good I felt. My mind was never fuzzy or forgetful and I could see SO clearly. I felt like I was riding a unicorn every day. Through rainbows. With angels singing. And glitter...lots of glitter. I was able to teach my 1st graders all day and head to the gym at night. Oftentimes, I would go to the gym at 5:00am, teach all day, and go to Jazzercise that night. I know not everyone has the luxury of going to the gym whenever they want, but hey….I’m taking advantage of that while I can! It was lovely to wake up in the morning and feel no guilt for what I ate the night before (I was notorious for binging on even the healthiest of foods). It was also very nice to eat as much as I wanted! When you eat the right things and you really listen to your body, you won’t over-eat. I didn’t count calories, weigh my food, or even have to worry about my carb intake. Have I cured my food issues? NOPE! I still struggle with food addiction. 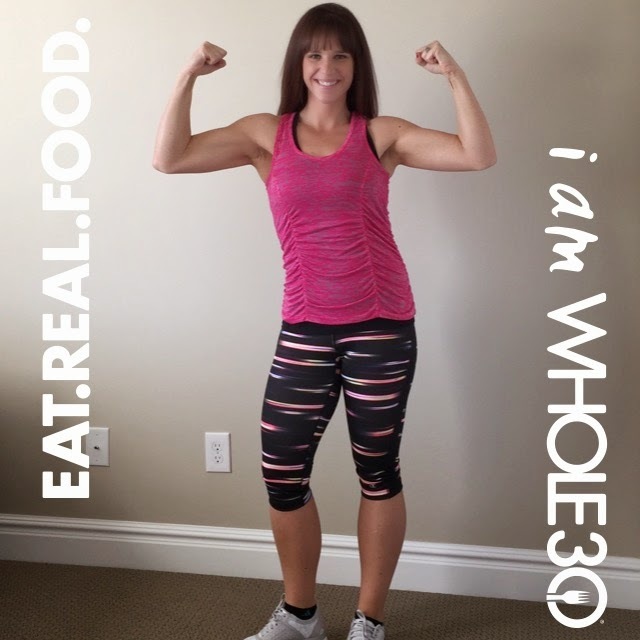 It has definitely opened up my eyes to the real struggle I have with food (#thestruggleisreal) and I am more conscious of the WHEN and WHY I eat, instead of just the WHAT. He’s a fierce SOB. He comes when you least suspect him. I had my knife ready to attack and I did! He never won a battle and I never reached for a Reeses Peanut Butter Cup. Luckily, I never got “carb flu” and started feeling good right away. My diet was pretty healthy beforehand, but I really needed to fine-tune it. Before whole30 I was eating a lot of “healthy” foods in excess, craving sugar, and eating SO many grains (allllll the organic tortilla chips in the world). Once I got rid and detoxed them from my system, I no longer craved them. It was very strange at the beginning to eat guacamole on my eggs instead of on a tortilla chip. Binge eat on all the things in the world? Nope. I am currently in the reintroduction phase of Whole30. My diet is still pretty Whole30 compliant, but now I introduce certain food groups slowly into my diet. It’s up to me to decide if those foods are “worth it” to me to have on occasion. Let me tell you, legumes are NOT WORTH IT. I felt like CRAP after eating peanut butter on my apple in the morning. Then, those beans for dinner did a number on my stomach (if ay know what I mean). It’s just not worth it to me. After reading “It Starts With Food”, I know what legumes are doing to my stomach and immune system. See ya later beans…I won’t miss you! As for the rest of the foods that I need to reintroduce…I’m sure there will be some that I’ll have on occasion because they are yummy and “worth it” to me. Cheese is one of them. I love me a string cheese and I could eat 10 of them in one sitting (not a good psychological response, I know). So, I’ll see how I feel when I bring dairy back into my diet, but I already know the verdict. I’ll feel like crap. Literally and figuratively. ;) It also gives me acne, which makes me want to punch a Care Bear. So, will I have it? We shall see! And if I do eat it once in a while...oh well! I’m an adult and I make my own decisions and it’s ok. That’s what I’ve learned on Whole30. If I want to eat something, it better be worth it to me. A piece of candy corn in the office isn’t going to “tempt” me. It ain’t nothing special. I am an adult and a food doesn’t “tempt” me to eat it. It doesn’t point it’s finger at me and wave me over. It doesn’t try to seduce me. But, I’m going to eat cake on my birthday and a Reese's on Halloween. I’m going to eat apples...never. I do what I want because I’m Whole30. So... you want to know more about what you're eating? Or maybe you want to figure out those migraines you've been having? Or tummy aches? You've got to read the book that goes along with Whole30. It's called "It Starts with Food" and I read it twice in one month. I still read sections of the book when I need a refresher. Ok, now I'm off to "watch" football with my husband! Have a blessed weekend! Labels: Challenge, Clean Eating, Oh Work it! Rachellle- Just gonna call you "Size 6 " now! I thinks I'd wear my clothes inside out so my tags showed!!! I am so excited for you and again so appreciative for all your honesty. Can you share your meal plans for the whole 30? There are no meal plans. It's just whole food for 30 days! We made really simple meals from scratch and never followed a recipe. You are such a rock star and I am completely and totally impressed with your entire journey! You are such an inspiration! Get it girl! You are such an inspiration. You rock my socks. I think I might read this book and see what's up :) Love you to the Big Dipper and back! Muah! SO thrilled for you! You are amazing! So amazing! I am SO happy, happy, happy for you! Congrats!! You did great- such an accomplishment :) Thanks for the shout out too!